Sweating is something everyone does in order to help control our body’s temperature. In fact, not sweating enough is unhealthy and can lead to your body overheating. Sweating is absolutely essential and is a normal reaction to help cool the body off. Excessive sweating, on the other hand, is not normal and is known as a disorder called hyperhidrosis. This disorder is characterized by sweating that occurs without being triggered by physical, physiological, thermal, mental or emotional triggers or stimuli. Hyperhidrosis is said to affect more than 15 million people in the US alone. The underarms, feet, hands, and groin area are the areas where the excessive sweating typically happens. It’s common one or two of these specific areas to be dripping in sweat while the rest of the body stays dry. This can lead to embarrassing sweat stains and marks and can even get in the way with day to day life. For instance, if your hands often get sweaty, then simple tasks like typing on the computer, opening a door, and even shaking someone’s hand can be difficult. Not just that, but having skin that is often wet or damp can lead to a skin infection, creating an even bigger problem. What’s unfortunate is that even though hyperhidrosis can interfere with everyday life, many people don’t reach out to get medical care for their condition. This is a shame because it is often caused by some type of underlying condition. It’s possible that genetics, prescription drugs, or even a health supplement can be the cause of excessive sweating. Hyperhidrosis can show itself in several ways. Besides generally excessive sweating, look for these other symptoms to determine whether or not you may have hyperhidrosis yourself. Being sensitive to the consumption of hot sauces, curries, cumin, etc. As you can tell by looking at this list of causes, there are endless ways it can become a problem. It may be one thing or a combination of these things causing it. Not knowing why exactly you’re having this issue can be frustrating since it makes it difficult to figure out how to address the problem. Some common treatments to help stop excessive sweating are with surgery, known as Endoscopic thoracic sympathectomy and Botox injections. Like many other traditional treatments, they may not be the best for your health and can potentially harm your health. Because Botox injections contain botulism bacteria, it can cause certain nerve activity around the injection to become blocked. Muscle activity can become reduced and weakened from the exposure to the botulism bacteria over time. When it comes to an endoscopic thoracic sympathectomy (ETS), a part of the nervous system located in the chest is destroyed during a surgery. This route is usually taken only in extreme cases that are debilitating. Other types of surgery can involve the removal of sweat glands from under the arms. The downside about all of these treatments is that they can cause undesirable effects such as pain in your muscles and limb weakening. It’s understandable that you would be more interested in figuring out how to stop hyperhidrosis in natural ways with minimal side effects. There are many different ways to stop excessive sweating without having to spend a lot of money on medical treatments and surgeries. These home remedies to reduce sweating are all-natural, very effective, and more than safe enough to try at home. Just about every health problem we run into in life can be addressed with some simple lifestyle and diet changes. If you have a poor diet, then you will benefit either way when you decide to make a diet change. The most important thing is to avoid processed foods. These include pre-packaged, ready to eat, fast foods, frozen, and deep-fried foods. Focus on eating fresh fruits and vegetables, organic eggs and chicken, wild caught fish, grass-fed meats, nuts, seeds, and whole grains. While making this change can be tough, once you cut out most processed foods, you’ll feel and see the benefits. If you’re a picky eater, find a few foods you eat and stick with those for a while. Once you’ve gotten used to eating less processed foods, then incorporating more variety of fruits and vegetable will become easier. Make sure you drink enough water to help faster detox of your body. Dehydration is a serious problem and if you’re sweating excessively, then it’s important to keep replenishing your body’s water to prevent chronic stress from dehydration. Being alkaline, baking soda can help balance out acids normally occurring in sweat. This will help to inhibit the growth of bacteria, thus avoiding the development of skin infections. Not just that, but the lowered pH levels and neutralization of acids also act as an antiperspirant. Aside from preventing skin infections, baking soda is effective in the treatment of these skin infections. 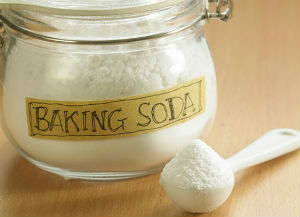 Baking soda helps to get rid of substances that are harmful to the body and neutralize undesired odors. 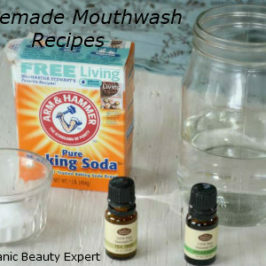 Using baking soda is very easy. The easiest way to use it is by placing baking soda right onto your armpits, or wherever else you experience excessive sweating to prevent odor and reduce the amount of sweating. While you might be wondering how to stop armpit sweating, baking soda is an amazing natural remedy to reduce sweating safely. Lemon Balm – An herb that is related to mint, lemon balm is effective at cooling the nerves to help reduce sweating. The most common way to use lemon balm is by ingesting its tea. Black Tea – Black tea contains something known as tannins, which decreases the skin’s pore size when applied to it. Use black tea by taking a clean washcloth and applying some brewed black tea to the area of sweat. 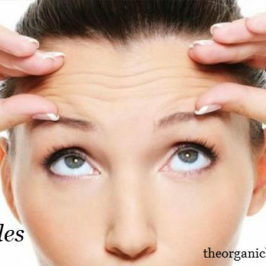 Sage – Sage reduces sweating and it is effective at keeping the skin dry. Being rich in vitamin b and magnesium, the overactivity of sweat glands can be regulated over time with regular use. Simply apply dried sage leaves on your body as desired. Motherwort – Avoid this remedy if you take medications for sedation. Motherwort is a natural nerve blocker and helps to regulate faster heart rates. Witch Hazel – Just like black tea, witch hazel also contains tannins. This helps cool the body and its nerves. Use witch hazel by steeping the leaves in water for at least 24 hours and apply it to the affected area. Potato – While it might seem weird, potatoes are effective at reducing excessive sweat. Simply slice the potato and place these slices in the areas where excessive sweating occur. Let the potato slices sit for some time, then wipe the areas with a damp cloth when you’re finished. Chamomile Tea – You may already have some chamomile tea in your pantry. Its popular benefits are its ability to relax and relieve anxiety. If you know that anxiety is the cause of your excessive sweating, then try drinking chamomile tea regularly. Omega-3s – Making sure you eat enough Omega-3s can help regulate your immune system and its responsive relationship with your thyroid hormones. Coconut Oil – Use coconut oil as a natural, antibacterial lotion that can help improve the appearance and condition of any damaged skin. Aloe Vera – Application of aloe vera can be done up to three times per day on any affected area. Aloe vera is very popular to use if you’re serious about learning how to stop armpit sweating. Apple Cider Vinegar – Apple cider vinegar has so many beneficial uses. Make a 1:2 solution with apple cider vinegar and water. Then apply this mixture to any affected area with cotton balls every night before sleeping. Wash the solution off in the morning. Tea Tree Oil – Tea tree oil is very powerful being antiviral, antibacterial, and antifungal. Help to treat and prevent the development of skin infections by adding 2-3 drops of tea tree oil to water, then applying to affected areas with cotton balls. Citrus Juice – Limes and lemons are naturally antibacterial and can help prevent the production of sweat. An easy recipe is to mix 1 tablespoon of citrus juice, 1 tablespoon of baking soda and apply it to any affected areas. After leaving it on for up to 20 minutes, just wash it off with some water. Grapes – Eat grapes regularly to help soothe your body from the inside out. Being rich in antioxidants, grapes can help regulate body temperature, potentially reducing sweating. Wheatgrass juice – Wheatgrass is extremely dense in nutrients such as b-complex, vitamin C, proteins, folic acid, chlorophyll, and more. Try drinking a cup of wheatgrass juice every day to reap its benefits. Cornstarch – Cornstarch can help to keep affected areas of your body cleaner and drier, helping to prevent infections as well. You may be wondering how yoga can help you. Well, yoga is very effective at naturally controlling excessive sweating. Yoga is focused on helping the body balance out, meaning that it can potentially improve sweating. And if anxiety is a cause of your sweating, then by practicing yoga a couple times a day can help improve anxiety levels. For those who are also experiencing higher weight, yoga is also beneficial to regulate the digestive system. This is beneficial for cleansing out toxins and promoting weight loss. It’s extremely important to treat hyperhidrosis as a serious health condition. That means if the natural home remedies we mentioned are not working and you can’t seem to get your sweating under control, then you need to seek professional medical help. The good thing is that these home remedies for excessive sweating are easy to perform and minimally invasive to your body’s natural chemistry. Even if you don’t have success with one of them, you won’t have to worry about adverse side effects or severe injury. Dealing with hyperhidrosis is not easy, but we hope out remedies can help you out. Like most health problems, it can be addressed with diet and lifestyle changes, while relief can be found with topical applications. 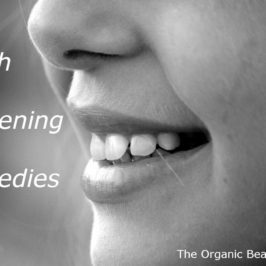 Try out these remedies one by one and see what works best for you.